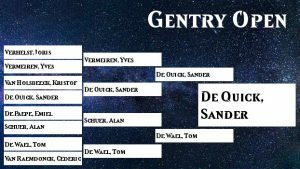 The Gentry Open is over, those of you that want to review a match that was played on camera can do so in the Youtube playlist featuredbelow. And for the number crunchers looking for new tech, the decklists are all posted under it. And this might be more important than in othertimes, since some of the first leaderboard events for the next season are before the rotation and thus these decks will be viable.